A focus on the study of forms and materials and a passion for engineering are the key qualities critics acknowledge in the work of architect Nicholas Grimshaw (1939), founder of Grimshaw studio, considered one of the most important representatives of the High-Tech trend in Britain. A focus on the details of construction and experimentation with new materials and techniques are part of the studio’s modus operandi, shared by the founder and the architects who work in Grimshaw’s studios in various locations (London, New York, Melbourne, Sydney, Kuala Lumpur and Doha). 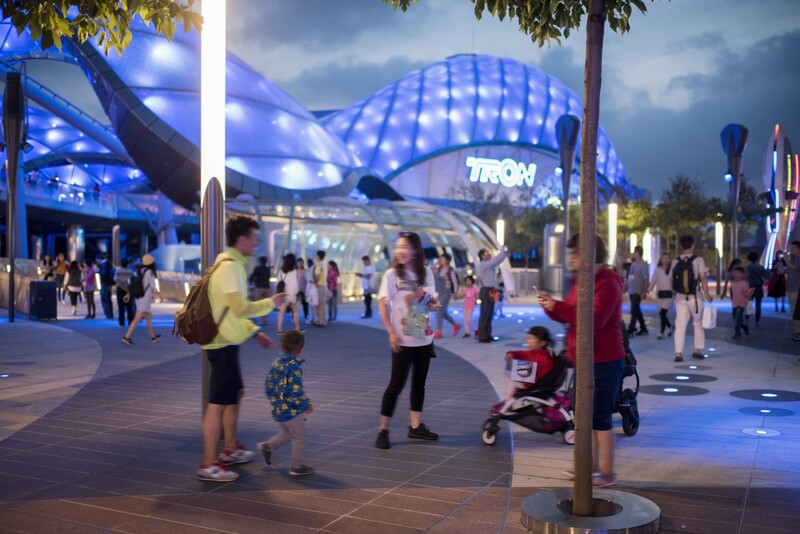 They are also a distinguishing feature of projects such as the Shanghai Disney Resort Tomorrowland, with its EFTE roof taking us directly into the futuristic parallel dimension of Tron, a character created by the historic American company. Shanghai Disney Resort is a theme park and resort built and inaugurated in Shanghai in 2016. It is the sixth Disney resort in the world and the second in China, after Hong Kong Disneyland, but it soon became the country’s top theme park. Themes shared by other Disney parks are redesigned and adapted for the Chinese public with additions such as references to the Chinese horoscope and little temples surrounded by greenery. The park is made up of seven “lands” introducing the public to different worlds created by Walt Disney, the newest of which is Tomorrowland, a series of attractions including a roller coaster inspired by the futuristic parallel world of the film "Tron Legacy". Futuristic motorcycles travel a route both inside and outside the building evoking the chase scenes from the film. Grimshaw studio worked in close collaboration with Walt Disney Imagineering on the definition of Tomorrowland and the development of attractions and routes allowing people to get oriented and move around easily in the park. A system of pathways on multiple levels connected by stairways and ramps takes visitors to different attractions. The curved pathways cross large green areas and gardens planted with particular species to create a sense of wonder and marvel as visitors discover the attraction. The roof of the roller-coaster ride dominates the entire composition with its wavy structure, becoming the true icon of the project, the element distinguishing and characterising it. Its unusual geometry is designed to maximise natural ventilation and provide shelter against the rain and the sunshine. It consists of a steel frame with cushions made of EFTE (Ethylene TetrafluoroEthylene), a light, transparent plastic material used as an ecological alternative to glass. Grimshaw studio had already used the material in other projects, such as the Eden Project in Cornwall, in which the EFTE dome structures protect the Mediterranean and tropical biomes. Grimshaw studio is the focus of the second event in The Architects Series, a new cultural format at SpazioFMGperl'architettura, the Milanese gallery and showroom operated by Iris Ceramica and FMG Fabbrica Marmi e Graniti, the top brands in the Iris Ceramica Group. Until June 8 visitors to the Milanese gallery can view two docu-films showing what goes on “behind the scenes” in the studio.